WORDS are sometimes easy to say. They can be too many. They have the power to WOUND. And the power to HEAL. Each of us have different strengths and weaknesses when it comes to words. We can be GOOD with them. Inspire, encourage and build others up. Or we can be BAD with them. Say the wrong thing at the wrong time and hurt people. Communication isn’t always easy or simple. We ALL get it wrong at times, both intentionally and unintentionally. We can say too much or we can say too little. It is not always easy to get right and even when we think we have, we can find that someone heard it all wrong anyway. We know that good communication builds strong relationships and bad communication can tear them apart. But it isn’t always simple to navigate and it certainly takes a lot of wisdom. Words can sometimes fly too freely from our mouths. It is not until later on that we might realise we didn’t think long or hard enough beforehand about how we communicated them. We gave too little thought to their consequences. Can you relate to that Proverb? Someone I thought was my friend didn’t like to be with me. They attack your confidence and your trust. They are not easily forgotten and cannot be taken back. Badly spoken words can wreck relationships and hurt others. We cannot change what we have said in the past. We also cannot change what others have said to or about us. But we can choose to use own our words differently, both today and in the future. We can turn the tide and use more thoughtful and wise words to HEAL others. I have been thinking about how wise and thoughtful words can heal and how can we use them more. Here are some of my conclusions. Using kind words can have more impact than you can imagine. In the same way that we remember words that hurt us. We can also remember significant kind words, especially when they are given during a difficult times. I can remember times when a short message on a card or a text has meant a lot and held much significance. We all face negativity and criticism. It seems all too easy for us and others to complain, moan and point out all the faults in what others do. In a world that can often hear a lot more negatives than positives we desperately need people who choose to encourage. Who are thankful and appreciative of others. Who choose to see what is right rather than just what is wrong. Expressing your belief in someone can restore their hope and vision for the future. People find it all too easy to pull one another apart but the words ‘I believe in you and what you are doing’ can be life changing and counteract discouragement and disappointment. We often think about generosity in terms of money or gifts. But we can also be generous with our words. Offering someone a kind word, compliment or encouragement can be a form of generosity because it puts that person first and shows that you are thinking about them. It takes time, effort and humility to reach out to someone with kindness. When someone writes thoughtful words down for you, you can re-read them, hold onto them and treasure them. I am sure many of us hold onto particular cards and letters with messages that really spoke to us at that time. These can be invaluable during difficult times in our lives. They remind us that someone, somewhere does care. When we give a gift of kind words to others we find that we get blessed too. Good communication builds strong relationships with others. It encourages others to use similar words back. It helps us to feel good in sharing them. We get the focus off ourselves and think about how we can help another and that always helps us to feel better too. The Proverb is so true. Thoughtless words DO wound deeply, but thoughtful, wisely spoken words DO heal. 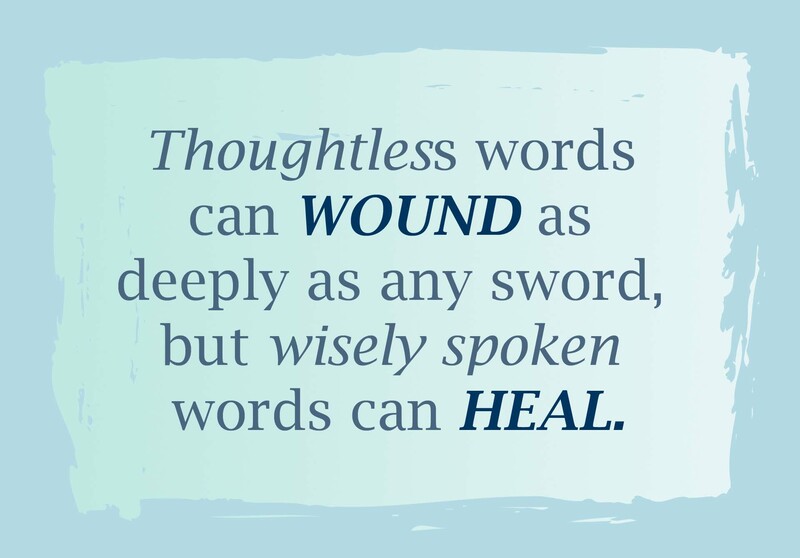 Good words not only build others up but they can also heal the wounds inflicted by other thoughtless words. That is why our words are so powerful. They really can change lives. Would you rather be a person who wounds or one that heals? I know who I would rather be! 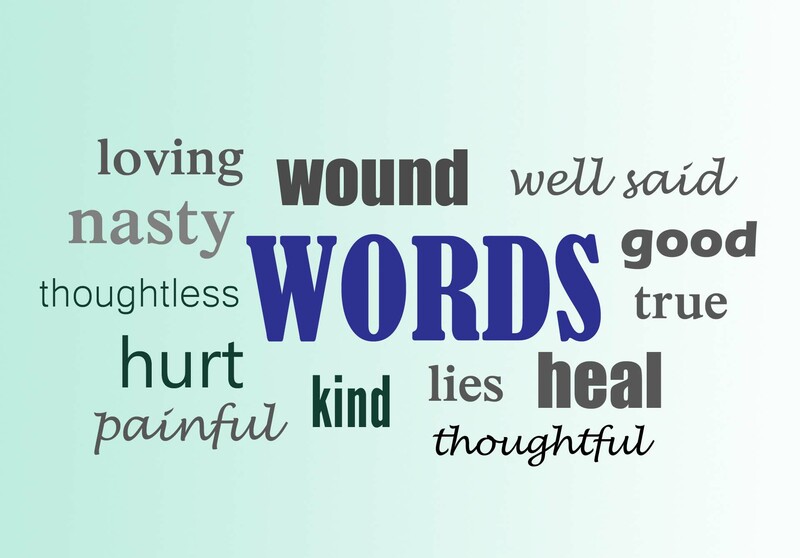 How do you think words can heal? Do you have any examples from your life?